Hundreds of thousands have taken to the streets in the Philippines in recent days to protest widespread government corruption, prompting solidarity demonstration led by the Filipino community in the United States. The ANSWER Coalition stands in full support of these mobilizations that challenge the wealth and power of elites who facilitate the exploitation of the country by western banks and corporations. 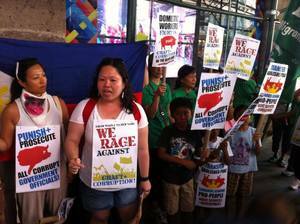 The demonstrations were prompted by revelations that Janet Lim Napoles, an extremely wealthy and well-connected businessperson, had embezzled $232 million in government funds, using much of it to pay bribes to politicians. This dramatized the long-standing “pork barrel” practice in which money that is ostensibly earmarked for development projects are funneled by senators and members of congress to their business and personal associates, and are in turn are rewarded with kickbacks. This systemic corruption is a direct legacy of the underdevelopment imposed on the Philippines by centuries of brutal Spanish and U.S. colonial rule, which continues today in different forms. One of the largest demonstrations so far took place in the capitol city Manila on Aug. 26, when over 100,000 people marched to express their outrage. The protesters are demanding the abolition of the “Priority Development Assistance Fund” – the main taxpayer-financed fund tapped by corrupt politicians. The day before the enormous Manila demonstrations, protests organized by Filipino groups in the United States took place in New York City, San Francisco and Los Angeles. At the New York City demonstration outside of the Philippine Consulate, Linda Oalican, Overall Coordinator of the Damayan Migrant Workers Association, demanded that the PDAF funds be redirected towards social services benefiting poor and working people in the Philippines as well as Filipino workers who have been forced to migrate. The ANSWER Coalition supports this growing movement and will continue to do its part to oppose the neo-colonial status imposed on the country, including demanding the immediate withdrawal of all U.S. military forces from the Philippines.